Function At A Higher Level! A healthier bar that tastes Amazzzzzing! We start with the cacao bean and deliver a responsible bar. Step into Tanzania with this 70% cacao dark chocolate bar which delivers the fruity, undertones of kiwi and green apple. This bar is truly from heaven. Really! The beans we imported from team Kokoa Kamili who are based in Mbingu, a small village. 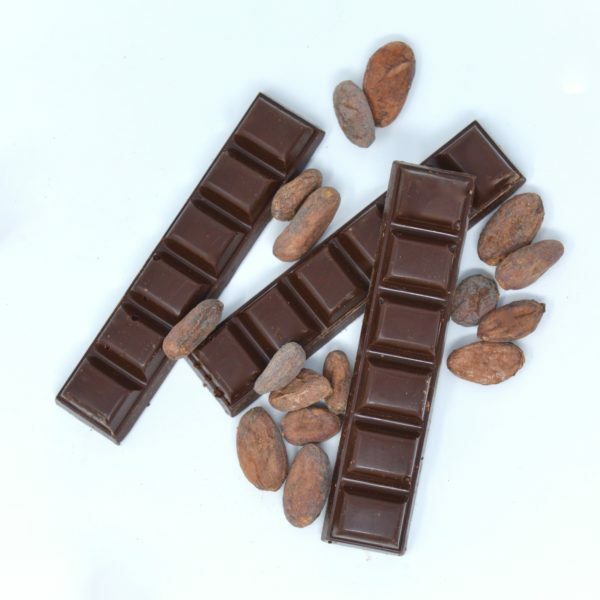 ‘Mbingu’, in Swahili means ‘Heaven.’ When it comes to cacao beans we often hear about the low prices paid to the farmers. Savor and share this bar. Know that the wet beans were directly sourced, the farmers were paid top price for their high quality beans. The fermentation process is sophisticated which plays an enormous role in the great flavor. This bar is full of pride, teamwork and community. 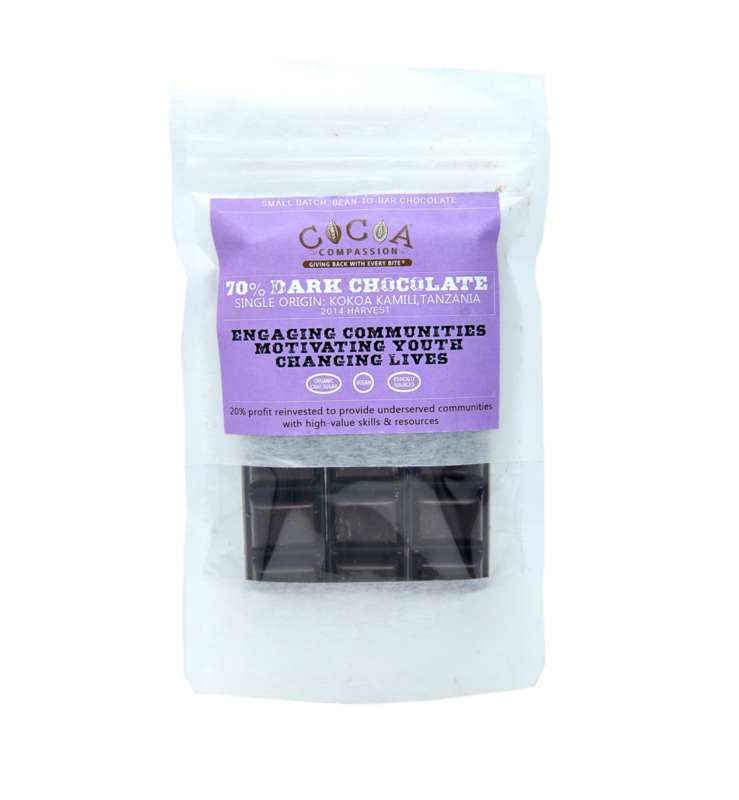 We Are Responsible 20% profit will be reinvested to provide underserved communities with the high-value skills and resources needed to turn local ingredients and materials into finished products that pave a path towards economic independence. Centrally fermented, cacao from the heart of Tanzania by Kokoa Kamili. 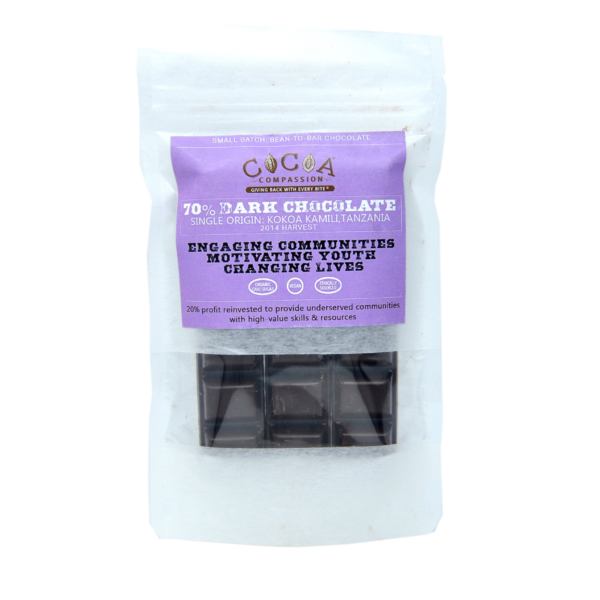 Roasted, winnowed, melanged and molded by CocoaCompassion® in New York. NUT FREE? None of CocoaCompassion’s products contain nuts. However, we are not certified nut-free. Please shop responsibly.